Google launched a new Product named 'Google Drive' . It looks that its really great. This Product is very newly launched like Gmail Tap. Every Google fan or Tech-Geek wants to know that What is this Google Drive? So let's take a look at What it is and What are its features. Google Drive is Google's newly launched product which lets you store and view your files, documents and almost everything online. You can upload your Documents, Videos, Pictures and much more files and can share them with others. This product is helpful for a house user to share his/her content with others and to store their files safely. You can access all your stored files on any device. Google Drive have applications for Google Chrome browser and Android. The iOS application will arrive shortly. So now you can store and share all your photos, videos and docs directly through Google Drive. Google Drive provides you 5 GB free space and you can also Buy more pace if you need. This will also help businessman or an entrepreneur to share documents online with co-workers and to collect necessary files from others. The best part of Google Drive is that it supports a large number of file extensions. So you can upload, view and share any HD video, any Photoshop file. There are almost basic 30 file types that are supported by Google Drive. Now let us take a look at its main features. Work Together: Now you can work together with your co-workers online. You can create new documents and edit old documents. Google drive will also show the name of the person by which the document was edited. All changes on any files will take place instantly. Improve Functionality of Gmail : Now there will be no need of attaching and sending files to everyone through Email. Just attach a link of the file and the file will go live on receiver's computer and they can do changes instantly. Improve Functionality of Google Plus: You can also share your videos and Pictures uploaded in Google Drive to your Google Plus profile. Google Drive will change your experience with Google Plus and Gmail. Now can share your Photos and Videos with your circles in a more simple way. Advanced Search: This feature is very good and one of the best. Google drive have a very powerful and advanced search, which lets you search your files with a good filtration. Google drive have image reader for reading images in documents and also have ability to read the whole text of documents, with this you can search and find your files more fast and easily. Wide Range of File Formats: Google drive supports a wide range of file formats. You can open almost all type of files such as media files, document files, adobe photoshop files etc. There is no need to find and install additional programs on your computer to open various files. Wide Range of Apps: There are many applications for Google Drive to try out. Visit this Chrome's Web Store page to see applications for Google Drive. 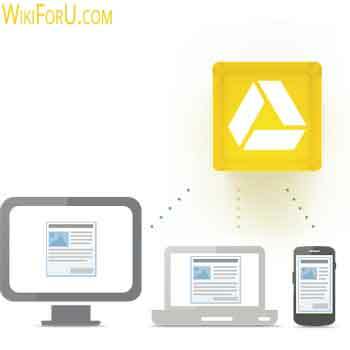 Get Your Old Files: Google drive keep a copy of every file you edit. You can revise your editing and can choose one of them. You can revise files as old as 30 days and can choose one of them to keep permanently. Share Your Files: You can share your files, documents and even folders with Google Drive. The good part of this the person with whom you shared can comment there and thus you can also start a discussion on documents.